Born on December 12, 1811 in Savoy, Massachusetts, Leonard Bliss Jr. was the eldest son of Leonard and Lydia (Talbot) Bliss, both born in Rehoboth. In 1828, he moved with his parents back to town, where they lived and worked on the Danforth Street farm of his paternal grandfather, Dr. James Bliss. Leonard Jr. was known as a good scholar and talented writer. He prepared for college at an academy in Amherst in 1830 and started at Brown University a year later. In hopes of raising some much-needed money during his third year at Brown, Bliss began research for the first study of Rehoboth’s history in 1833. He continued the project despite a period of ill health. His book, The History of Rehoboth, Bristol County, Massachusetts; Comprising A History of the Present Towns of Rehoboth, Seekonk, and Pawtucket, From Their Settlement to the Present Time, was published in 1836 and distributed to 265 subscribers. After teaching and working as an editor and writer in the area, Bliss moved to Louisville, Kentucky, with his younger brother James in 1837. Still pursuing his interest in history, he became an officer of the Kentucky Historical Society and a scholar of Revolutionary War general George Rogers Clark. By late 1839 he was also editor of the well-regarded Louisville Literary News Letter. Bliss’s report about Henry C. Pope, a candidate for public office, offended Godfrey Pope, editor of the Louisville Sun and Advertiser and a cousin of Henry, to the extent that Pope shot Bliss in late September 1842. He died from his injury on October 6. 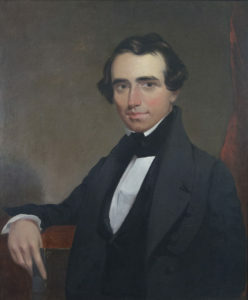 Bliss’s portrait was given to the Rehoboth Antiquarian Society at its founding by Caroline M. Carpenter, his fiancée at the time of his death. The book Bliss holds in his right hand memorializes his career as an editor and writer. His History of Rehoboth, still admired at the turn of the 20th century, was incorporated into George Tilton’s 1918 history.